I was hit by someone who doesn’t have car insurance. What do I do? Is it a good idea to have my friend or relative be a witness for my car accident case? I have to pay back my health insurance company from my car accident settlement? Why? 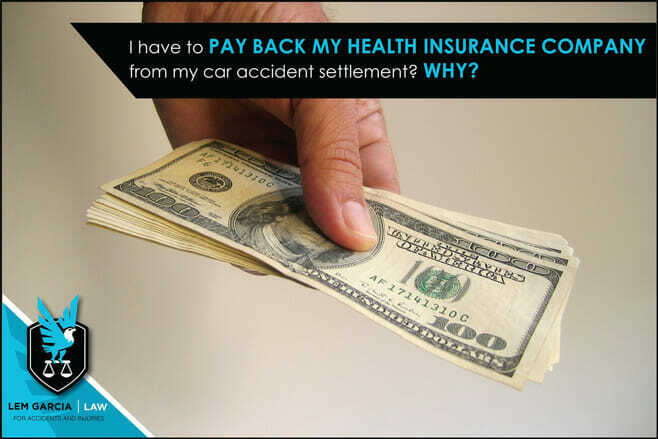 Yes, in most situations you will have to pay back your health insurance company from your car accident settlement. Most health insurance contracts contain language in it that states that your health insurance company has a right to get reimbursed for the medical treatment they paid for if there is a third-party recovery. If you recover money from the other party in a car accident you are involved in, the other party is the third party. For example, if you are rear-ended by another driver on the freeway and you have to go to the emergency room by an ambulance, you will have a bill for the ambulance company and the emergency room (at a minimum). Your health insurance carrier will most likely pay most of the bill and you will only have to pay the co-pay. If your health insurance company pays $1,000 for the ambulance ride and $2,000 for the emergency room visit, they most likely have a right to get reimbursed $3,000 if you recover money from the person who rear-ended you (every health insurance policy is different, but most insurance policies state that they have a right to get reimbursed). This process is call subrogation. Before your health insurance company is reimbursed, you must first recover money from the person who rear-ended you. If you do not recover any money from the person who rear-ended you, then your health insurance company does not have a right to recover any money. The reasoning why your health insurance company gets reimbursed is because you are supposed to recover the cost of the medical bills from the other party. In settling your case with the third party, you are supposed to submit all of your medical bills to the other party for payment. Here, you should have submitted the $1,000 ambulance bill and $2,000 emergency room bill to the other party for payment. The other party should have compensated you for your medical bills, and your pain and suffering and lost wages. Therefore, since you should have recovered the cost of the medical bills form the other party, that money should go back to your health insurance company that paid it. If you don’t pay it back, you are getting paid twice for your medical treatment (your health insurance company paid the bill for you and then the car insurance company paid you directly for the bill). However, if you have not been made whole from the third-party recovery because they did not pay you in full for your pain and suffering, then you have an argument that you were not paid in full and therefore the health insurance company should not be paid in full. Furthermore, if you are represented by an attorney, the health insurance company may be required to reduce their right to reimbursement significantly because they are required to pay their share of attorney’s fees on the case since your attorney worked to get their money reimbursed as well. Every insurance policy is different, and this is general information about how medical bills that are paid by a health insurance company may have to get reimbursed from a third-party recovery. The information here is merely legal information and is not intended to be construed as legal advice. If you need a car accident attorney in West Covina, or in the Southern California area, feel free to call Lem Garcia Law for a free case strategy session.